AlipayHK’s expansion of its footprint across Hong Kong continues with the addition of McDonald’s Hong Kong to its portfolio, as AlipayHK users will now be able to order and pay for food by e-wallet using the McDonald’s app on smartphones. In addition to the new payment method, which has been open to AlipayHK customers since 11 April, the company is also offering rewards to attract users to the payment tool. 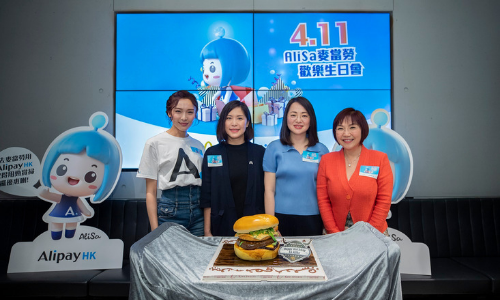 After adding McDonald’s Hong Kong into its partnership – and with it, a portfolio of nearly 10,000 restaurants – Jennifer Tan, chief executive officer of Alipay Payment Services (HK), said the collaboration will enhance the convenience of mobile ordering. The launch coincides with AlipayHK’s unveiling of its first virtual ambassador “AliSa”, named after the words “happiness” and “pleasure” in Hebrew. The ambassador is a further tool aimed at engaging Hong Kong people to explore the possibilities of future living.